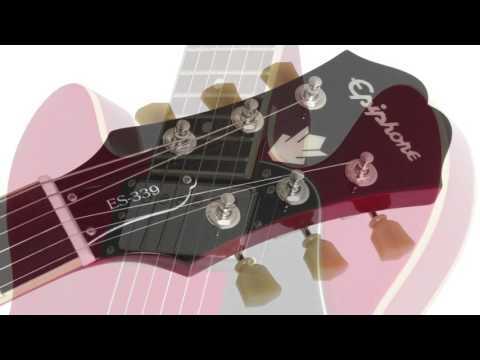 With its roots firmly planted in the rock and roll revolution of the late 1950's, the Epiphone ES-339 has established it..
With its roots firmly planted in the rock and roll revolution of the late 1950's, the Epiphone ES-339 has established itself as an iconic semi-hollowbody guitar. The Epiphone ES-339 Pro cuts down the size of the trademark body to make it even more playable, and Alnico Classic 'buckers give it a unique tonal signature. The Epiphone ES-339 continues the archtop legacy with a slightly smaller body, while retaining the bell-like tone and elegant construction of the original ES335. A laminated maple body and solid center block ensures bags of sustain and a versatile set of tone shaping options. The ES-339 can easily be adapted to any musical style, but is a favourite for legendary jazz, blues and rock guitarists over the decades. Thanks to a pair of Alnico Classic Pro humbuckers, the vintage tone of an ES semi-hollowbody lives on in the ES-339 Pro. The introduction of push-pull coil tapping allows you to quickly switch between spanky single coil and harmonically rich humbucker tones. The Epiphone ES-339 PRO features rock-solid hardware including Epiphone’s LockTone Tune-o-matic bridge and LockTone Stopbar tailpiece. TheES-339 PRO has all nickel hardware along with Epiphone “Deluxe” 18:1 ratio vintage style machine heads with tombstone buttons.